17a. [“That makes three strikes for O’Toole!”], PETER’S OUT. 26a. [“Uh-oh, Sajak has fallen in the field!”], PAT’S DOWN. 40a. [“Now we have Nicklaus at bat”], JACK’S UP. 50a. [“There goes Zuckerberg, trying for a steal!”], MARK’S OFF. 64a. [“Fisher made it to first base!”], CARRIE’S ON. Utterly fresh and wrought with consistency. The names chosen are a good mix—actor, game show host, golfer, business titan, actress. 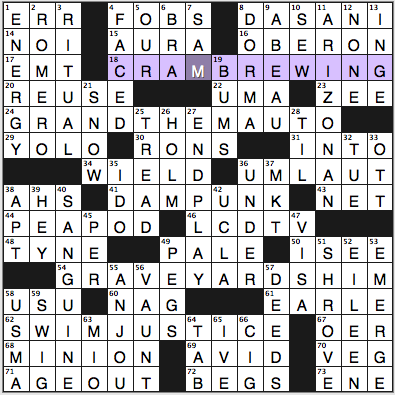 Top fill: BREWPUB, ODD JOB, SEESAWS, BOTTLE-FED, JAKARTA, BUGABOOS, SORE LOSER. Favorite clue: 1d. [Title for Horatio Magellan Crunch, on cereal boxes], CAP’N. Worst fill: OLEO. That’s it. Everything else is ordinary and familiar—exactly the sort of stuff one hopes to find in a crossword puzzle, with clues adding a little uncertainty and spice rather than obscure words trying haplessly to liven up the proceedings. Lynn has that all-too-rare gift: the ability to distinguish between language that’s actually commonplace and the words that fester in crosswords far out of proportion to their use in the rest of life. No festering here! 4.25 stars from me. P.S. I met regular Fiend commenter Huda when I was on vacation over the weekend. It will not surprise you to hear that she’s absolutely lovely in person, so interesting and congenial! This is one puzzle whose title does not offer immediate entrée into understanding the theme—which makes things very interesting. Or that was my experience at any rate. Still, while solving, I kinda figured it out; and when the reveal confirmed my hunch—62D. END [Backside…or a hint to the puzzle theme]—I could see how canny that title turned out to be. But first things first. What a winning theme set we get today. Especially as each entry yields up a great base phrase—and this is the tricky part—by “forward thinking”—by leaping forward over the first word and then adding END. The cluing is smartly fine-tuned, too! 17A. BITTER PILL [Hard-to-accept result, figuratively]. Exactly. 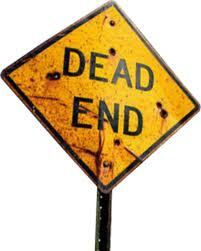 And then: bitter end—which might describe the final stage of any acrimonious or especially painful situation. Or, better still, remind us of the Greenwich Village institution, the nightclub that’s been down on Bleecker Street since 1961. Just take a look at the comedians and musicians who have come through its doors. Yikes. 63A. LIVING WAGE [Working person’s need]. Now there’s an accurate, no-nonsense clue/fill pair. Livelier is the base phrase, living end—which might describe the most, the best, the [insert your superlative here] anything/anyone. The utmost. May be a tad hyperbolic, too. But peppy. Like so much of the remainder of the puzzle. I got a lotta love for the understated “GOT A MATCH?” [Troubling request from a pyromaniac] pair as well as its grid-opposite, SALESLADY [Avon professional]. It may not have a spotless record, but Avon— founded in 1886 with its perfume, then jewelry, sales—has come a long way, baby, and can be rightfully proud of its philanthropic activities. And don’t ASTRIDE and BEDEWED make for fine poetic pairing? Especially like that poetic/image-making clue for the latter, [Moist, like grass at dawn]. [Graceful spotted wildcat] for OCELOT, is lovely, too. [“Shakespeare in the Park” scuffles] for ADOS. As in Much Ado About Nothing. Multiple productions. [Takes the heat from?] UNARMS. As in divests someone of his/her firearm, and not “feels the pressure” from. [Glossy fingernail polish] ENAMEL. Another product for the Avon saleslady. Another intra-puzzle tie-in. [Like a goth’s complexion] for ASHEN. Another good image-maker. Ditto [Masked puck stopper] GOALIE. Now I’d like to see a goth in a goalie mask. [Jam-packed containers?] JARS—”jam-packed” with jam, and another tight squeeze. [Rand who created Dagny Taggart] AYN, who had a way with names in her novels. Dagny is the female protagonist in (what’s considered to be) Rand’s magnum opus, Atlas Shrugged. Click here for the whole cast of characters. The words PIXIE and VOUCH, EENSY and JABBA (who’s anything but); the colloquial “XOXO,” “HOPE SO!” and “ALL NEW!” This puzzle simply has lots to recommend it. Finally (wrangling some with the title aside), I found this to be a very smooth solve. There was no one area that brought me up short or that felt forced. It was not unchallenging, mind you—but there was some sort of inner logic that, in combination with all those image-making moments, made this a dynamic and most satisfying kind of solve. Works fer me! Wouldn’t ya like to walk barefoot thru this on a summer’s morning? Easy one this month. 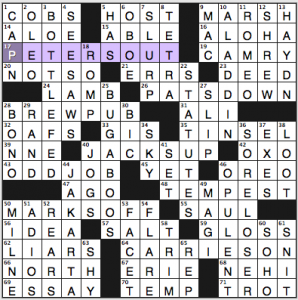 :), this puzzle’s author wrote to me on Friday. At first I was relieved since I’m under a little time pressure this week, but then I thought: is that a friendly smiley or a sinister one? Are there really several layers of Blindauerian wizardry to uncover, or is it really just a straightforward puzzle? I think it’s the second one, but such is the paranoia of the regular solver of Patrick’s monthly puzzle. 17-A [Metal molding] = DIE CASTING. Not a thrilling clue or answer. 31-A [“White Christmas” star] = BING CROSBY. Much better. Do not disrespect the Bing. 49-A [One who washes without water] = DRY CLEANER. 64-A [Deep conviction] = FIRM BELIEF. 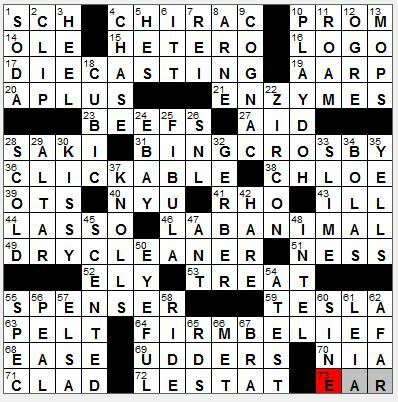 Slightly contrived but OK.
73-A [Inner ___ … and word that can come inside the first words of this puzzle’s four theme answers] = EAR. They are: D(EAR)IE, B(EAR)ING, DR(EAR(Y), and FIR(EAR)M — nice one there. So that’s amusing enough. Not your typical Blindauer 500-foot home run of a crossword, but, to mix baseball metaphors, you’ve gotta throw an 80 mph watermelon right over the heart of the plate once in a while, just to keep them paranoid. It’s working for me, since I’m still not convinced that there aren’t more layers to this one. As usual, tell me in comments if I missed anything. ***Professional grid. I dig the two connected French C??? ?C entries of CHIRAC and COGNAC, the unforced Z at the corner of ENZYMES and ZIRCON, and of course PLAY-DOH. ***Cluing was very easy. My time is lost to history but I think it was a Delfinian sub-5 minutes. ***Top three clues: [“Bravo,” below the Rio Bravo] for OLE — “Rio Bravo” is what Mexicans call the Rio Grande –; [Hide from a trapper?] for PELT; and [Magnifying glass victim, perhaps] for ANT. But if you do this to anything bigger than an ant and you’re more than 8 years old and you don’t feel bad for the ant afterwards, have I got a show you’ll love. 18a. [It’s in front of a catcher], HOME PLATE. Baseball player slides into home. 26a. [“CSI” workplace], FORENSIC LAB. Microscopic slides. 44a. [Instrument used in Hawaiian music], STEEL GUITAR. The guitarist uses a slide on the strings, as seen here in this 1976 Barbara Mandrell video. 57a. [Place to make a splash], WATER PARK. Big ol’ water slide! This is a perfect early-week theme. The four phrases come from different arenas, they all involve different meanings of “slide,” and all are singular nouns. And then! Ron and Zhouqin spice up the grid with plenty of lively fill—CLAMOR, MAITRE D’S, RED LOBSTER, INTERPOL, TAHITI, PIE CHART, TEAM SPIRIT, and OLIVE OYL. The only fill that leaves me cold is ALAI and A-TEST; the rest is all solid. I can easily tolerate one or two “meh” entries in a puzzle. They don’t impede my enjoyment of the puzzle at all. It’s when a constructor has the “meh” stuff all over the grid, or packed into an ugly little corner, that I grumble. 4.25 stars from me, same as for today’s NYT by Lempel. It’s a good Tuesday, people! That is a rare thing. Edited to add: Thanks to Argyle for pointing out my oversight of the co-constructor! This is Mr. Toth’s debut. 24a. [Magnificent car driven by giant B-movie ants? ], GRAND “THEM” AUTO. Grand Theft Auto video game meets Them from the ’50s. 41a. [Beaver with a mohawk? ], DAM PUNK. Daft Punk, beaver dam. 54a. [Part of a door to a cemetery? ], GRAVEYARD SHIM. Graveyard shift. Minus 100 points for the non-metric YARD asserting itself here, even though it’s in a different context and the theme is M and FT. It’s not helping that while feet can be converted into meters, a yard is a much closer approximation of a meter. 62a. [Comeuppance at the pool? ], SWIM JUSTICE. Swift justice, mete(re)d out. Cross-reference that should have been made: 51d. [___ Tuesday], SHROVE and the nearby 32d. [Weekday abbr. ], TUE. 9d. [“You could really be ___ Brummell baby…” (Billy Joel line)], A BEAU. Awkward partial but I like the song! “It’s Still Rock and Roll to Me.” You can’t dress trashy till you spend a lot of money. 21d. [The white stuff? ], SNOW. It was either that or BLOW. 4a. [Electronic keys], FOBS. I have two FOBS on my keyring: one for the car and one for the home alarm system. 63d. [“Water enhancer” brand], MIO. People! Just drink the water. Don’t add artificial colors, artificial sweeteners, and preservatives to your water. Fill I’m not keen on, by category: Partials NO I, A BEAU; abbreviations EMT, USU, ENE, USMA, UCLA, MKT, TUE (although actually, I would argue that USMA and UCLA are good fill despite being abbrevs); crosswordese ZEE, OTT; plural name RONS; plural interjection AHS. Five theme answers, grid often gets crowded with chaff. Good morning ladies and germs! Today’s puzzle, offered up to us by Mr. Bruce Venzke, provides a trail to a popular snack. We have a word ladder in the grid, with the first words of four of the theme answers setting up the reveal at the end. SNORE UP A STORM: (42A: [“Saw logs” in a big way]) – Proud to say that I’m not a snorer…at least I haven’t gotten complaints in a long while about my sleeping habits. Before we get to the good entries, there were a couple that made me do a double take: WILE E. (31A: _____ Coyote of cartoons]) and GELATI (48A: [Tratorria treats]). It’s the same when Lee J. (Cobb) is in a grid: the first name with the middle initial just looks so unsightly. At least with gelati, it’s the correct way to pluralize gelato, but it still looks a little blah as well. But as I said, there’s some good fill in here, and NONPLUS tops the list (41D: [Perplex]). Have never seen a game/competition of ROADEO, but there has to be a YouTube clip of truck driving skill, right (43D: [Competition for truck drivers])? I’ve cut soda out of my diet for the most part, but, if I had to choose between Pepsi and Coca-Cola, I’d choose Coke…sorry PEPSI (1A: [Cola choice]). Oh, and seeing D-MINUS (22A: [Passing grade, but barely]) reminded me of a quote a former classmate of mine at college kept uttering near the end of our senior years: “D equals diploma.” A mantra to live by while in college, huh?!?! “Sports will make you smarter” moment of the day: CONE (15A: [Scoop holder]) – One of the most underrated pitchers, in my opinion, in Major League Baseball history, David Cone made his name mostly in the Big Apple while pitching for the New York Mets (1987-1992, 2003) and New York Yankees (1995-2000). In the 1991 regular-season finale, Cone tied a then-National League record by striking out 19 Philadelphia Phillies batters in a 7-0 Mets win. As a member of the New York Yankees, he won four World Series titles (along with one he win in 1992 as a member of the Toronto Blue Jays), and was remembered for two remarkable starts. Cone had missed most of the 1996 season after an aneurysm was detected in his arm, but in his first start after missing all of that time, he pitched seven no-hit innings in a September game against the Oakland Athletics. He was lifted from the game because he was on a pitch count. Three years later, Cone became the 16th pitcher to throw a perfect game, pulling off the feat against the Montréal Expos on July 18, 1999. Cone also won the Cy Young Award in the strike-shortened 1994 season, when he went 16-5 with a 2.94 ERA for the Kansas City Royals. Cone is now a part-time color commentator on Yankees games for the YES Network. Have a great day, and see you all tomorrow! This entry was posted in Daily Puzzles and tagged Bruce Venzke, C.C. Burnikel, Elizabeth C. Gorski, Lynn Lempel, Matt Jones, Patrick Blindauer, Ron Toth, Zhouqin Burnikel. Bookmark the permalink. 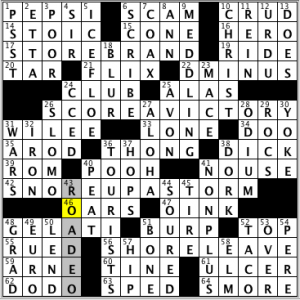 I think that the review of the NYT fill might have been a little generous (I don’t remember the last time I even saw a NEHI, and I use OXO products routinely but don’t notice the brand except in crosswords), but I had the exact same experience – it was just a fun puzzle to solve and beautifully executed. Nothing felt forced at all. Easily my favorite early-week puzzle in a while. Very enjoyable NYT puzzle! It’s interesting that these names all mean something in regular speech that’s not intended to be evoked by the name itself. As opposed to names where the connotations of the name and the noun are the same: Grace, Faith, etc. Very clever! Amy, it was such a pleasure to meet you in person after reading your blog for years! It was great fun for me. And the bonus was meeting the rest of your wonderful family. Mad talents hiding behind this trio’s engaging and friendly ways! Americans need to start consuming OXO beef spread… Google suggests that importing it from South Africa or England is against USDA rules at present alas. 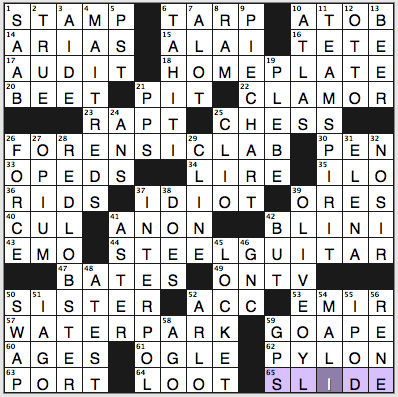 Another dimension to the theme answers in the NYT is complementary pairing: OFF/ON, DOWN/UP. There’s no IN for OUT, but OUT can be paired with DOWN in a different relationship. While all the clues arguably fit baseball, I would say OUT, UP and ON are idiomatic and DOWN and OFF not so much. DOWN is much more appropriate to football and with OFF, I can think of a number of baseball references leadOFF hitter, caught OFF the bag, etc., but my first thought is horse racing (and they’re OFF). The Nicklaus reference was interesting because UP is also idiomatic to golf as in “you’re UP,” used on the tee–“you’re AWAY or you’re OUT” would normally be used for later shots based on who is farther from the hole. I grant you that the clues were all obviously specific to baseball. Off to a great start this week in the NYT! In case it wasn’t clear with my website puz, I was trying a new twist on the word-that-can-come-before-or-after theme. My recently constructed tough puzzles are heading to the AVXC and Lollapuzzoola. Is anybody going to reserect poor old Elena Verdugo? She’ll pop up from time to time, and I’ll complain about it. Her name is known to older solvers, whereas Justice Kagan’s name ought to be well-known to solvers of all ages. Verdugo’s heyday was 40-50 years ago and the world has moved on. I must admit I’d never heard of her, but she seems to have had an interesting and varied career, so I’m glad I’ve heard of her now. She was in some horror films and in an Abbott and Costello film that has a good rating on IMDb, and did a lot of other things, but she must be best known for her role on Marcus Welby, M.D., on TV, a show which I never saw. She received two Emmy nominations for Marcus Welby and has a star on the Hollywood Walk of Fame. She is also still living, so curb the disrespect please. (Do I mean for you to be disrespectful of those gone? Not really.) As with all proper nouns that are not so well known, it would depend on the crosses. Alas, 35a, CS puzzle is clued wrong. AROD plays third. He moved from short when he came to the Yankees. Two great puzzles today! Very strong, especially thematically! Loved Ms. Lempel’s interpretation of verbs as names. The LAT theme is one of my favourite genres – finding phrases associated with a particular word used in different manners always strikes me as a very imaginative theme concept! Grammar purists probably cringed at MAITREDS, which is MAITRESD if you’re true to the original French! But does this look like a French crossword? Ron Toth was co-constructor with C.C. on the LAT. Plus it was his debut .